Idrottsgalan is annual awards where Sweden as sport-loving and health-caring nation praises people achieving success internationally and proudly representing Sweden in the world of sport. 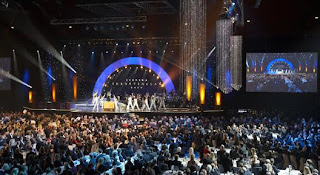 Every year Idrottsgalan becomes show connecting all country together in front of TV-screens with breathtaking pre-win pauses, funny jokes and big pop-stars with some special performances. This year among biggest music guests of the show in Globen were Darin, Molly Sandén, Johnossi and Måns Zelmerlöw. Darin delivered colourful disco-performance of opening and closing the show with The Jacksons' "Can You Feel It" (yep, we remember that Michael is the biggest Darin's Idol), Molly Sandén performed classic cover of "Forever Young" (this girl was born to stand on the stage in hero poses singing some anthemic ballads and she did it again as stunning as she can), Måns Zelmerlöw with Lisette Pagler performed some sort of trailer for musical Romeo & Julia (that was hmm...not trivial! ), Johnossi was singing Summer hit "What's The Point" and Lena-Maria Klingvall (amazing singer, swimmer and painter born without hands but achieving so much more than people use to!) performed cover of "You Raise Me Up" with Nacka Musikklasser. You can check all performances below.